We are currently designing a Master Bedroom for a client and we are mixing styles. We want to add a modern touch to the space. We thought that a mirrored night stand would be such a sleek and modern statement. 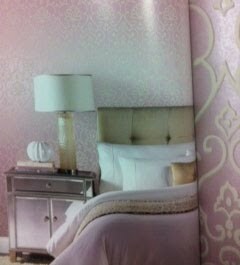 We also love the lavender damask wall paper from Antonia Vella which gives the space a soft and soothing atmosphere.